An innovative technology designedto launch future passenger-carrying rockets via a carrier aircraft has beentested over the desert landscape of Mojave, California. Transformational SpaceCorporation (t/Space) of Reston, Virginia and Scaled Composites ofMojave wrapped up three weeks of flight tests yesterday, drop-testing prototypeboosters at altitude. The tests are part of t/Space work on a proposedCXV people-carrying capsule and its QuickReach II booster concept. The dummyboosters released by aircraft used a technique that caused them to rotatetowards vertical without requiring wings. According to a company pressstatement, this concept allows an aft-crossing trajectory in which theair-launched hardware crosses behind the aircraft. That's adifferent approach than other air-launched rockets, such as the Pegasusbooster, the X-15 rocket plane, as well as SpaceShipOne after release from itscarrier plane, the White Knight. These craft use wings to turn themselves fromhorizontal flight to the vertical position, then head skyward on suborbital ororbital trajectories. The t/Spacetechnique greatly enhances safety, according to officials working on theproject. The new airlaunch method is called Trapeze-Lanyard Air Drop (t/LAD) launch. 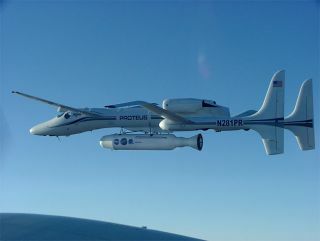 The test dropsutilized the Proteus aircraft built by Scaled Composites. That company, led byaerospace designer, Burt Rutan, also built and flew SpaceShipOne. Accordingto t/Space, in addition to greatly enhancing safety, eliminating the wings increasesthe payload a rocket can take to orbit. The innovation developed by t/Space isa device that remains attached to the nose of the deployed booster - all of ahalf-second after the center of the rocket is released. That slighttug on the booster's nose starts the hardware rotating as it drops. A smallparachute on the rocket's nozzle ensures this rotation does not happen quickly. The Mojavetests involved three sub-scale dummy booster drop tests: May 24, June 7, andJune 14. The mock boosters were comprised of two steel tanks welded togetherwith a Fiberglas nose and nozzle. They were 23 percent of the size of theactual rockets to be developed for sending a four-person capsule into orbit,noted a t/Space statement. Since thedummy hardware had no engines, each booster crashed onto the dry Cuddeback Lake,about 35 miles northeast of Mojave, California.The wreckage was collected and removed. Transformational Space Corporation LLC is developing vehicles for NASA's Visionfor Space Exploration. As one of eight companies funded by NASA, t/Space is developingconcepts for the agency's Crew Exploration Vehicle (CEV), a sought after way totake over non-cargo duties from an eventually to be retired space shuttlefleet. NASA agreedto let t/Space use some of its $3 million study money to build and testhardware in addition to conducting analytical studies. The successful drop testprogram, t/Space pointed out, demonstrates that small companies using rapidprototyping can develop new hardware very rapidly. "We wentfrom brainstorm to booster drop in just 135 days," said David Gump, presidentof t/Space in a company press statement. Contractorson the t/Space team include: Scaled Composites Inc., the company that last yearflew privately-sponsored suborbital flights with its SpaceShipOne, as well as AirLaunchLLC, a firm under contract with the Defense Department to develop a low-costresponsive launch vehicle.